Android has a great feature to customize your smartphone or tablet home screen the way you like. Sure enough, if you are not happy with the Home screen app launcher that ships with your Android device, you are free to replace it with any other third party Home Launcher from Google Play Store. Today, we’re going to have a look at some of the unique home launchers for Android and explore their various features. This is one of the best Android launchers available and is currently under active development. It had got loads of cool animation effects and is highly customizable. The launcher also supports unique widgets that really looks good on just about any Android phone. It’s smooth, snappy and easy to use; and there are lots of things that can be achieved with this great launcher. Let’s explore TSF shell in a bit detail. After installing TSF Shell, pressing the Home Button will first let you choose an available launcher. Choose TSF Shell (also check the “Set as Default” option to make it your default) and wait for some time. When TSF Shell is finally ready, the home screen shows some default app shortcuts at the bottom of the screen. There is a lot of things you can do while on the Home Screen. Pressing on the Dock Menu button on the lower left corner of the screen toggles visibility of the dock. So, you can keep your home screen as minimalistic as you like. The right side of the dock has a More (…) icon, clicking on which pops up further buttons letting you set your default home screen, add more screens, access app specific settings, and even open a lasso tool for multi-selection of items. But all this is just the beginning. Long pressing an icon from any screen allows you to move it to any home screen of your choice. The lasso tool can be very useful for organizing your icons. Just select the tool and draw a random enclosed boundary, starting and ending at the same point. The icons present within the boundary will be selected and you can choose among multiple options to apply on your selection – Arrangement, Gather, Multi-Choice, Create Folder or Delete. The Home Screen also has a multi-tabbed sidebar which can be pulled up by swiping along the left edge of the screen. The sidebar gives access to your favorite apps, important network settings and some useful and fun-filled animated widgets. The app drawer has some pretty cool transition effects that can be previewed before applying. You can also hide/unhide icons from the app list, or completely uninstall them, all from the app drawer. Widgets are one of the coolest features of TSF Shell. The integrated widgets, while featuring smooth graphics and animations, provides quick and easy access to useful information. Some examples of such widgets are the animated clock, weather, messages and music. There are also some widgets for fun and entertainment, like the photo gallery, zeppelin, pumpkins and ghosts too! You can configure customizable gestures to perform predefined action. This is an optional add on to indicate missed call and unread message count on relevant app icons. Though TSF Shell launcher is a resource hog, its performance is smooth and snappy on almost all medium and high-end Android phones. TSF Shell is available for download from Google Play Store. Next up in our unique launcher line up is Next Launcher 3D. From the makers of Go Launcher, this launcher has some impressive user interface and features some pretty good animation effects. 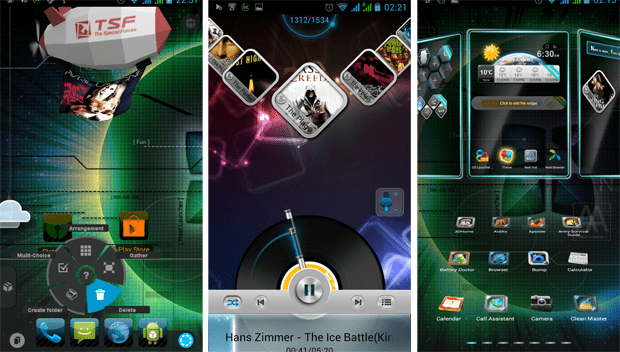 Customizable Home Screens; user has the ability to add or remove home screens, and set the default home screen. Ability to edit Home Screen folders. Comes with Widget Support, including those for Music, Weather and Task Manager. Unread call and message notifications. Integration with other Go Apps like Go Weather. All these and more exciting features with some smooth, eye catching animation and transition effects. Download Next Launcher 3D (Paid / Lite). This is a completely unique concept used for making Android Home Screens and might have borrowed some idea from the desktop based application called BumpTop. Rather than being a conventional launcher replacement, 3D Home tends to achieve exactly what it says; it brings a 3D representation of “Home” right into your Android Phone. 3D Home takes you in the middle of your own apartment room, where you can place various objects of your choice, and even add objects from the Store. If you want a launcher that closely represents your living place, 3D Home is the launcher to try. The most appealing feature of the launcher is its presentation. You can touch and organize literally every corner of your room. By default, you get a large LCD TV with a music system in front. A laptop (closely signifying the Microsoft Surface tablet) perched on the round table in front of you along with a few other objects like a phone (Galaxy S4? ), an address book and some Sticky Note pads. Each object in your room can be associated with a frequently used app on your device. For instance, the LCD television shows a preview of videos and movies available on your device. Tapping on the LCD launches your favorite Video Player app. Similarly, the music system opens up the default music app, the phone on the table launches the Dialer app, the address book opens the Contacts app, and so on. If you touch the upper part of the screen, you can see the sky on which you can view the latest weather information with animated clouds and a zeppelin with a flying banner ad! The viewing angle of your room can be changed by swiping the screen left or right, up or down. Pressing on the Menu hard key reveals the launcher settings menu through which you can access the Store and download/add more objects, or open up System and App settings. 3D Home is a unique 3D Launcher that breaks the conventional trend of Android Launcher apps. Download the app and give it a try. Note: If you want to get full version of paid Android apps for free, you can try using Aptoide. Read more about Aptoide over here.